I rarely make gift tags. In fact, I don’t think I ever shared one here on this blog. So when I saw the inspiration for this week’s challenge at CASE Study, I thought it was time to make some tags! I think it is quite obvious how I was inspired. For the one on the left I used a large flower just like Keisha did. I used the SU! Blossom punch with some pink vellum to make the flower. The center is a large white brad. 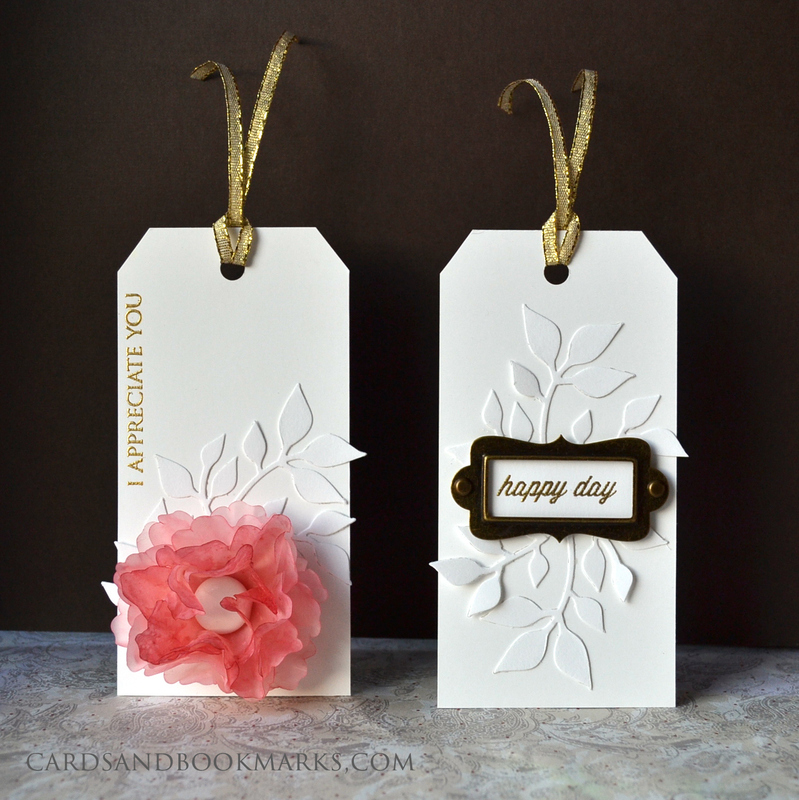 As for the one on right, I used a similar layout as the other tag by Keisha. The leaves are die cut from a Sizzix die. The bronze metallic frame is bought from Michaels. It is my first time using such embellishments and I quite like it! For both tags the sentiments were embossed in gold. Make sure to stop by the CASE Study blog to see the beautiful works of my colleagues. And I hope you will get a chance to play along! Love your tone-on-tone tags, Tasnim! I’m with you … not a big tag maker, but I do agree they make a present look extra-special. The nice thing about your tags is that they’d go with pretty much any style or color wrapping paper. Love that! That vellum bloom is to die for! Gorgeous tags!!! The white on white with the leaves is sooo pretty! The pink vellum bloom…wow. That flower is so pretty! Love these! Gorgeous tags Tasnim, love love adore that flower! It is always a treat visiting your blog. You provide such incredible inspiration; I love your projects and artistry. Thank you so much for sharing. The white on white is wonderful. These are beautiful. Simplicity is elegance. Tasnim, your tags are stunning! So beautiful! I especially love that vellum flower, amazing!